Often neglected by historians, actions in Missouri and Kansas had an important influence on the course of the Civil War, with profound effects for the communities and people in the region. 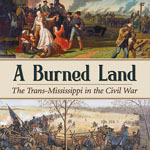 Join us as author Robert R. Laven discusses his book, A Burned Land: The Trans-Mississippi in the Civil War. This book focuses on the experiences of the soldiers, officers and civilians on both sides. Outside of Virginia and Tennessee, Missouri was perhaps the most hotly contested territory during the war.